At left, pictured are members of the first Mission EDC Crew after having received their certificates of completion. A school year’s worth of work by female students from Mission High School’s T-STEM Academy and Mission Collegiate High School was recently showcased during special presentations. 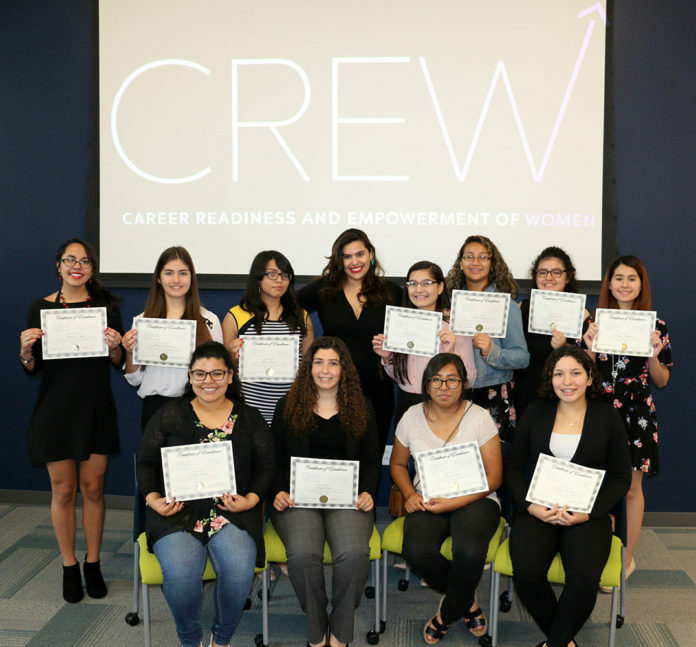 The 11 students participated in the first Career Readiness and Empowerment of Women, or CREW, program offered by the Mission Economic Development Corporation. The CREW provides interns with the soft and technical skills needed to succeed in entrepreneurship and STEAM fields through four core areas: career lab, mentorship, social innovation and coding. Not only do the interns go through intensive career readiness training, but they also create professional networks with successful women across the globe. During the second semester, CREW interns focuses on developing solutions to problems affecting their community by embarking in social innovations projects. After completing an intensive coding course, the students create a website for their respective social venture. It is these social ventures that were showcased recently. Each student presented their venture business plan and website to a small audience. These ventures included: a non-profit that prepares unemployed and underemployed women for careers; a smart watch technology that notifies first-responders when a patient’s pulse stops; a site that allows teens in the arts to connect with each other; a teen-led organization that motivates teens to explore the Rio Grande Valley; an app that prevents teenagers from unlocking their cars if they are under the influence of alcohol; a shelter for recent immigrants that also offers language and career classes; an app that connects teens with medical professionals; SAT/ACT tutoring prep through a video game; a company that provides feminine hygiene products to low-income girls through an app; an app that helps teens transition into adulthood by providing them with information on mental health, wealth management, and college advice. The students who made their final presentations are: Angelina Ayala, Laura Zavala, Odalis Villarreal, Yatzziri Ruiz, Xitlaly Villanueva, Carina Martinez, Kysela Garcia, Brijida Luna, Daisy Powers, Ana Gonzalez and Chelsie Barrientos. The CREW internship program is the first time that a high school program has been based out of the Mission EDC.